Perail hails from the Aveyron region of France, where Roquefort is produced in a region that has a long history of sheep herding. There are many theories of how Perail came to be in existence. Stories range from the bloomy brie-like sheep’s milk wheels being created during low milk production, to shepherds holding back small amounts of milk from the larger Roqufort producers and creating the small pure sheep milk cheese in their homes for their families and neighbors. Whatever the stories and history may be, we are fortunate to have this tasty treat available to snack on now. Perail is a pasteurized sheep’s milk cheese with a thin, bloomy rind and soft, pale paste. When young, the interior is more firm and mild in flavor and the grassy notes are very apparent. Allow it to get a bit more ripe, which is what I did, and the rind collapses a bit, the “sheepy” barnyard flavors intensify, and the grassy, buttery, and sweet flavors come alive. Pair Perail with a light white or sparkling bubbly wine or perhaps a crisp hard cider. The Super Bowl is this Sunday, February 1st and it’s the second largest day in America for food consumption behind Thanksgiving. Chips and dips along with various bean, veggie, or cheese spreads are the go-to food choices to eat during the Super Bowl, followed by chicken wings, popcorn and pizza. I get that these are traditional treats, why stay with the old boring stand-by? Serve up some tasty Gruyère and Andouille Gougères and guests won’t just be cheering for their favorite team. What’s a Gougères? Simply put, it’s a small ball of puffed of savory French Choux pastry made with just flour, eggs, salt, water and cheese. The cheese most commonly used for these simple treats is either Gruyère, Comté, or Emmentaler, however various forms of Blue, Roquefort, and Stilton have been used in recipes as well. Follow the recipe below and score a touchdown at your Super Bowl 49 gathering tomorrow. Stay Cheesy! Preheat oven to 425° with racks in upper and lower thirds. Line 2 baking sheets with parchment paper. In a large saucepan, combine 1 cup water, butter, and 1/2 tsp salt. Bring to a boil over medium-high heat. When butter has melted, add flour all at once, stirring vigorously with a wooden spoon. Reduce heat to medium; keep stirring until mixture has formed a smooth, thick paste and pulls away from sides of pan, about 3 minutes. Transfer to bowl of a stand mixer fitted with paddle attachment or to a large heatproof bowl. If using a stand mixer, add 4 eggs, 1 at a time, mixing on low-speed until egg is incorporated and dough is smooth before adding the next egg. If mixing by hand, add 4 eggs, 1 at a time, stirring with a wooden spoon until egg is incorporated and dough is smooth before adding the next egg. The mixture should be very thick, smooth, and shiny. Stir in Gruyère and andouille. Use a tablespoon measure to drop dough into 1″ rounds about 1 1/2″ apart on prepared baking sheets. You should have about 24 gougères. In a small bowl, whisk remaining egg with a pinch of salt. Brush the top of each gougère with egg wash.
Bake for 15 minutes. Reduce oven to 375°, rotate baking sheets, and continue baking until gougères are puffed and browned, about 15 minutes more. Serve warm or at room temperature. The French are known to produce some of the smelliest, most intense cheeses in the world. From the mildly offensive Roquefort to the bus-banned Epoisses, French cheeses are among the stinkiest and oft-times most tasty. Unfortunately, the latest attempt at funk has proved fatal. Three people have died and five more were injured at the unveiling ceremony for Normandy’s newest stinky cheese, Chausettes de Fesses (translation: socks of buttocks). You can read more about this cheesy tragedy on The Daily Shame. 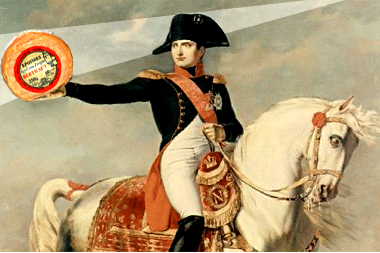 What do Napoleon, Emperor Charlemagne, and Charles de Gaulle have in common? Besides being heavy-duty leaders in history, these guys loved their cheese. Wonder how Camembert got its name or the difference between blue cheese, Roquefort, and Gorgonzola? Dubby Bhagat of The Himalayan Times has put together a brief list of some famous cheeses and how they came into being. For a more in-depth history, check out The Nibble’s article which breaks down cheese throughout history by time period. No surprise the Dark Ages were stagnate for cheese innovation. Read full articles at Saying Cheese and The History of Cheese.